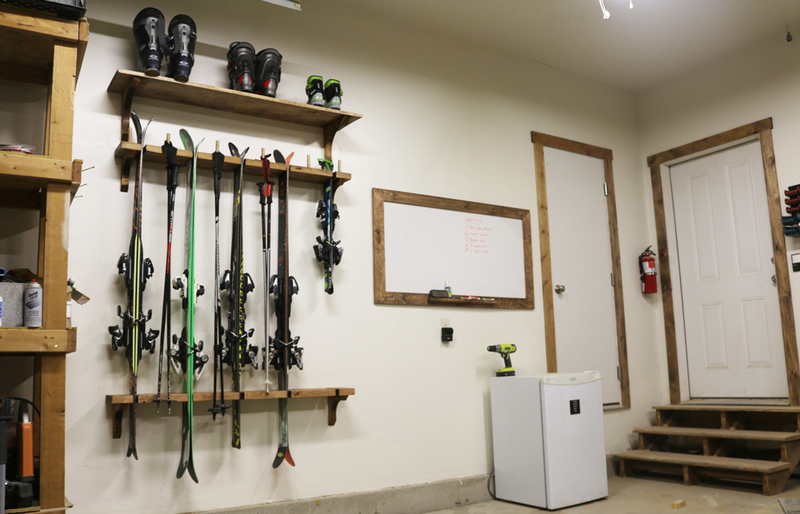 Organize your skis, poles, and boots for the whole family with this easy to build ski rack. A top and bottom unit hold the skis together on both ends. 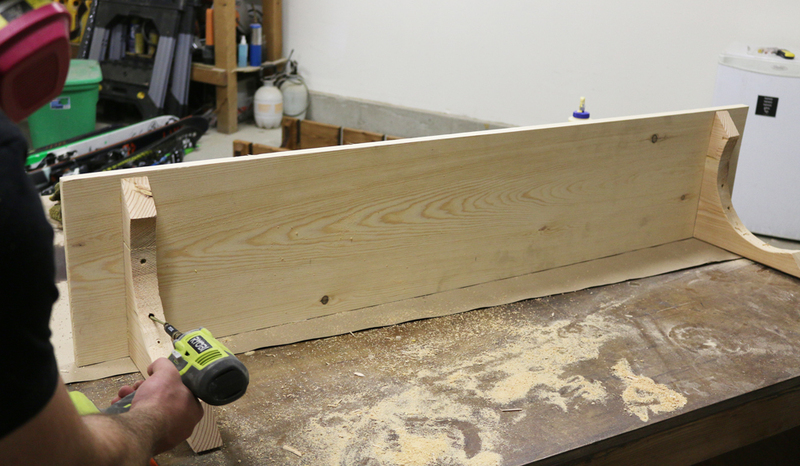 3/4 inch wide grooves are cut for each pair of skis. Dowels are used to hold the poles and an additional shelf can be added above for boot and helmet storage. This project can be completed in a half day to full day depending on your skill level and the finish used. This ski rack was stained to give it a more finished and complete look. 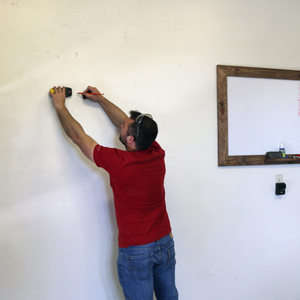 Click here to download DIY Pete's project plans for this How-To! 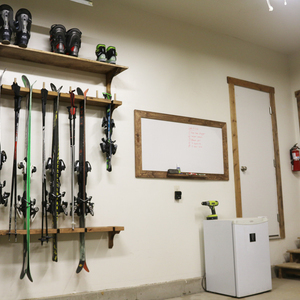 First, find an area in your garage to install your ski rack project. 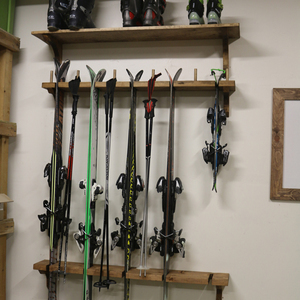 This rack is just over 4 feet wide, but please feel free to modify it if you have more or fewer skis. 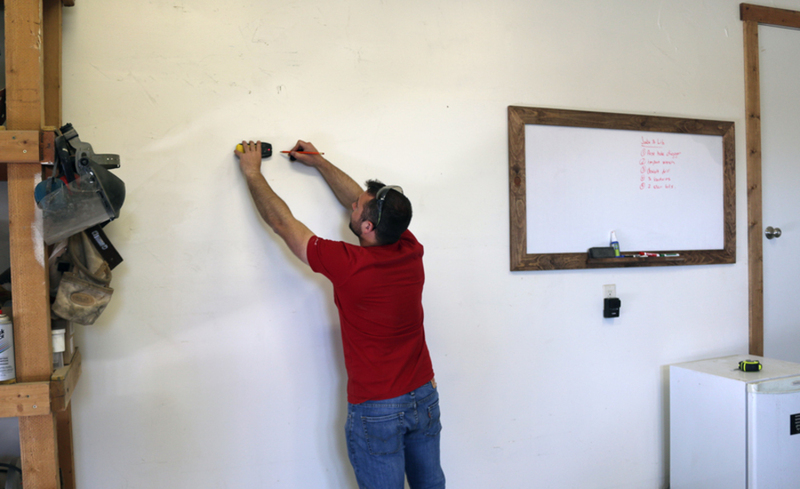 Use a stud finder to determine where the studs are in your wall. Generally, studs are 16 inches on center. 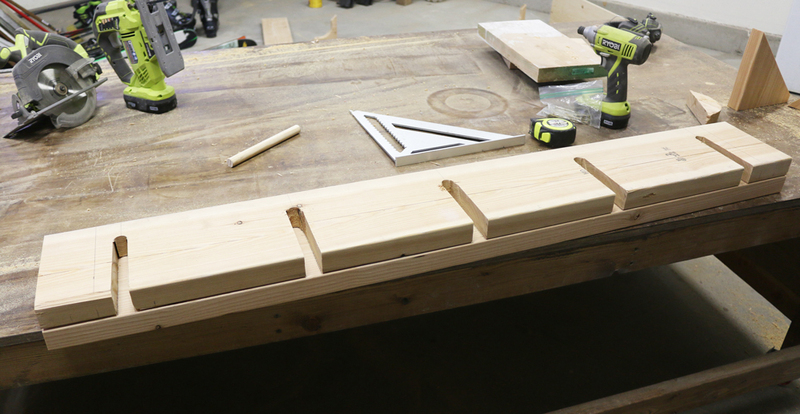 You'll be attaching the brackets for each rack unit to the studs to create a solid connection. 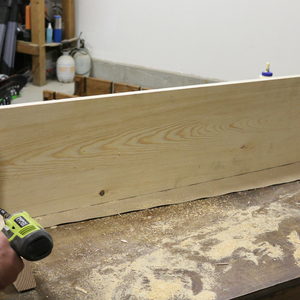 Cut the long horizontal boards down to size according to the cut list, or to the dimensions that best fit your space. I cut the 2 long boards to 52 1/2 inches. 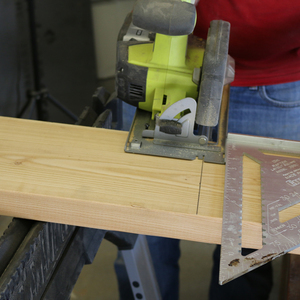 Use a circular saw or miter saw to make this cut. 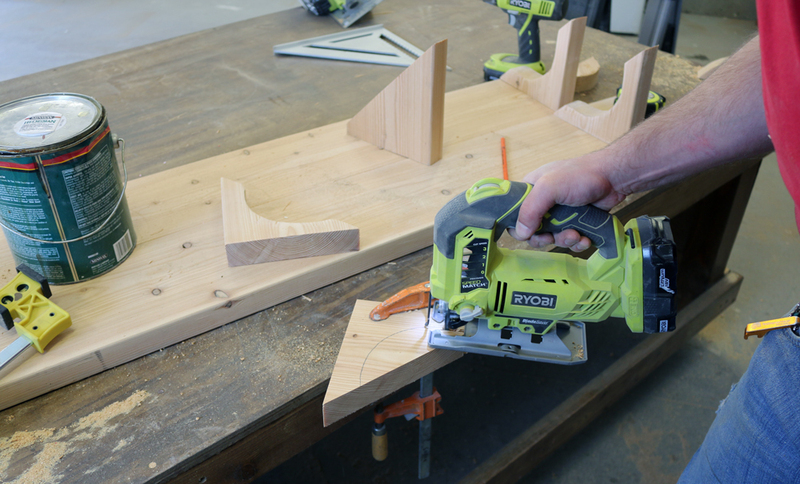 Use the remaining scraps of the 2x8 board to cut brackets for the upper and lower ski rack units. They'll measure roughly 7 1/4 inch by 7 1/4 inch. 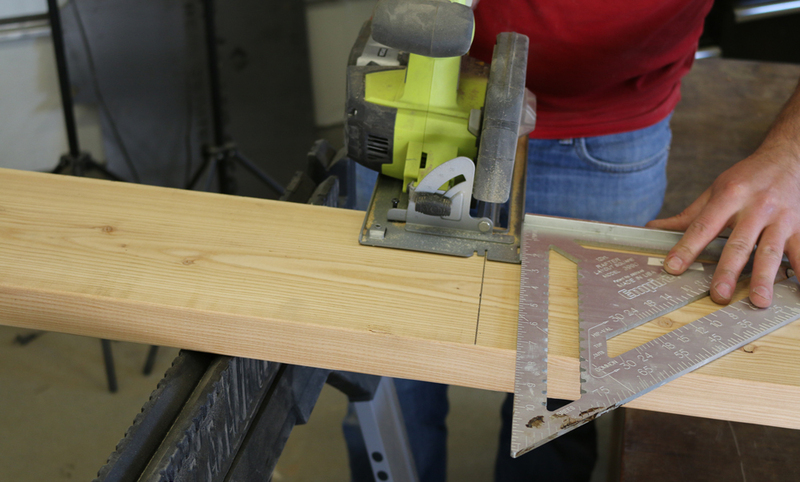 Cut the boards at a 45 degree angle. You'll need a total of 4 brackets. 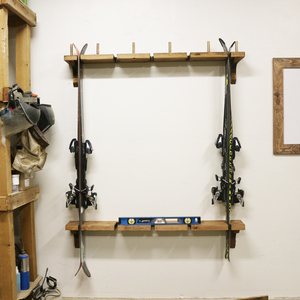 If you choose to make a wider ski rack I'd recommend increasing the number of brackets. 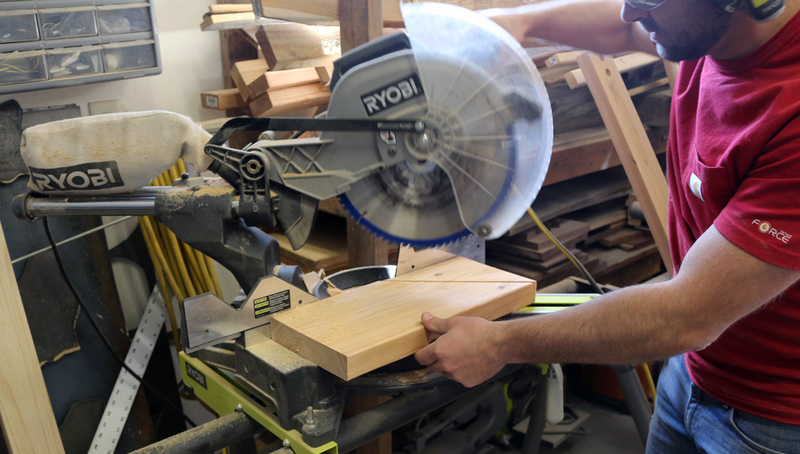 If you'd rather not make your own brackets, you can purchase wood or metal brackets at the store. Use a 1 gallon paint can to create an arch in the bracket. The arch gives it a nice look. 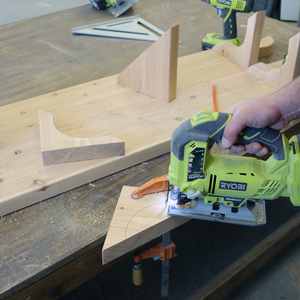 Clamp down each piece and cut the arch out with a jig saw. The first completed bracket can be used as a template to help make the remaining brackets. Determine the placement for each ski slot. 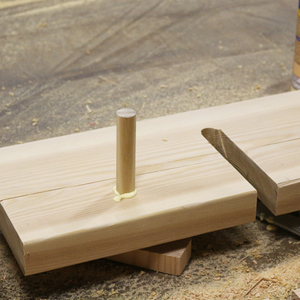 You'll want about 10 inches between each slot to accommodate for the width of the bindings. 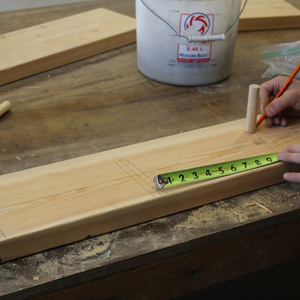 Each ski slot is 3/4 of an inch wide and 5 1/2 inches deep. This will accommodate most skis. 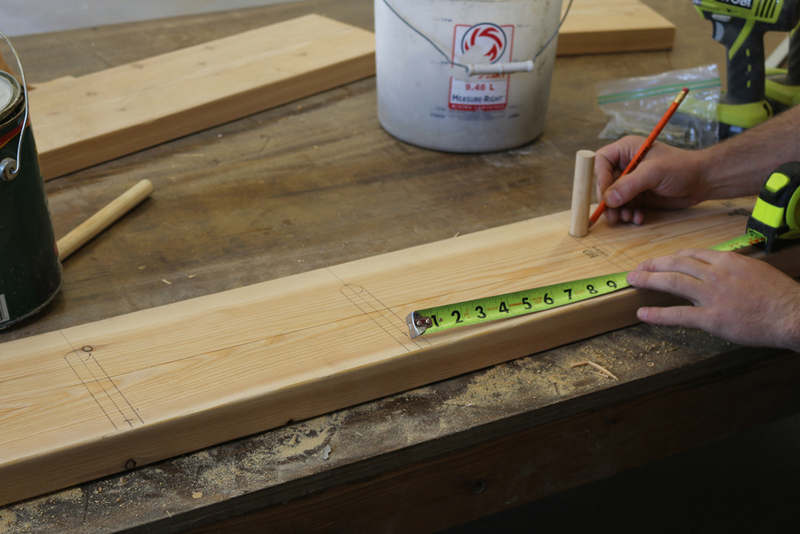 Trace around a 3/4 inch dowel to get a rounded slot, and use a carpenters square to draw the straight lines on each side of the ski slot. 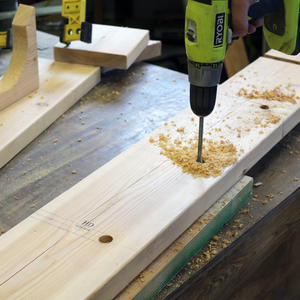 Use a 3/4 inch spade bit to drill the hole for the back of the ski slot. Drill down as straight as possible. 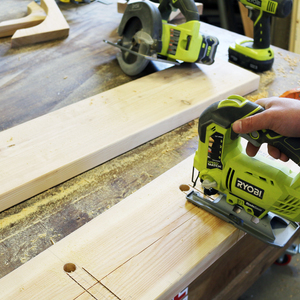 Cut the slots using a jig saw. 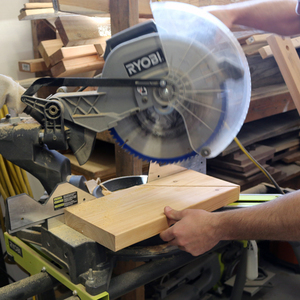 You can use a circular saw to help cut the sides as straight as possible. Then finish with a jig saw to get the remaining area. 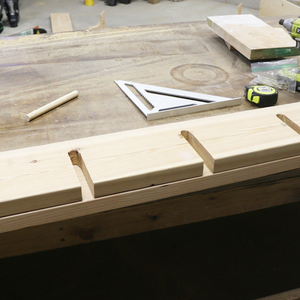 Replicate the slots for the second section of the ski rack. 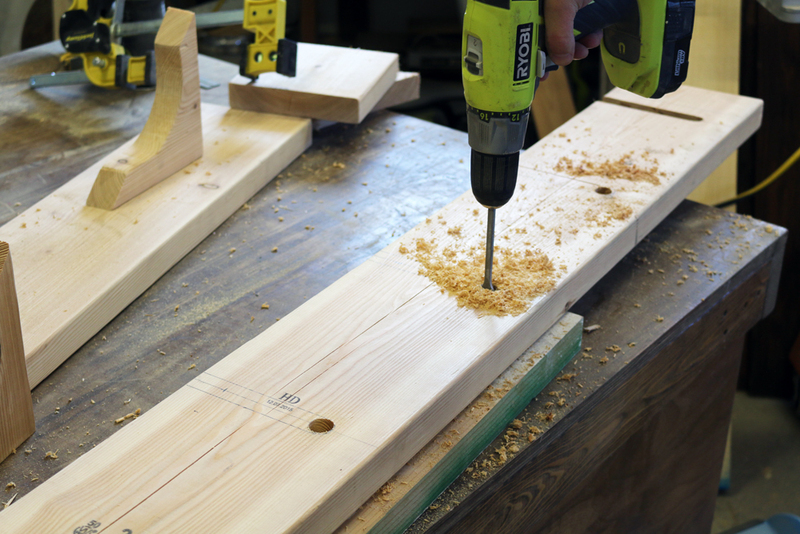 Drill 3/4 inch diameter by 3/4 inch deep holes on the top side of the upper part of the ski rack with a spade bit. Cut 4 1/2 inch sections of a 3/4 inch diameter dowel. 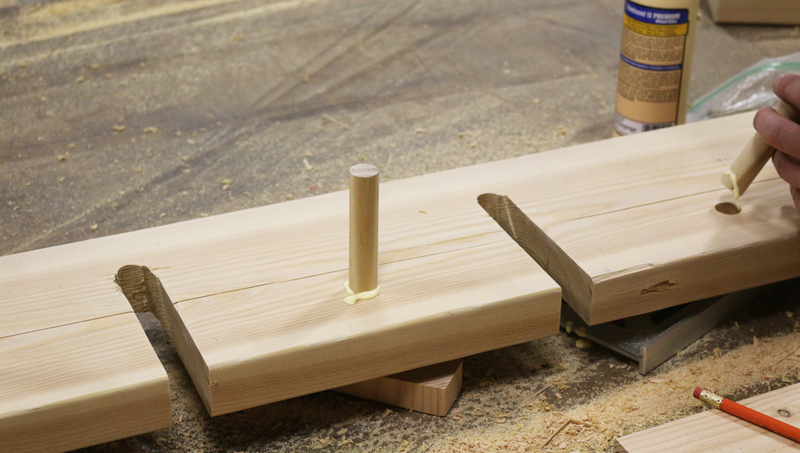 Glue each dowel in place. 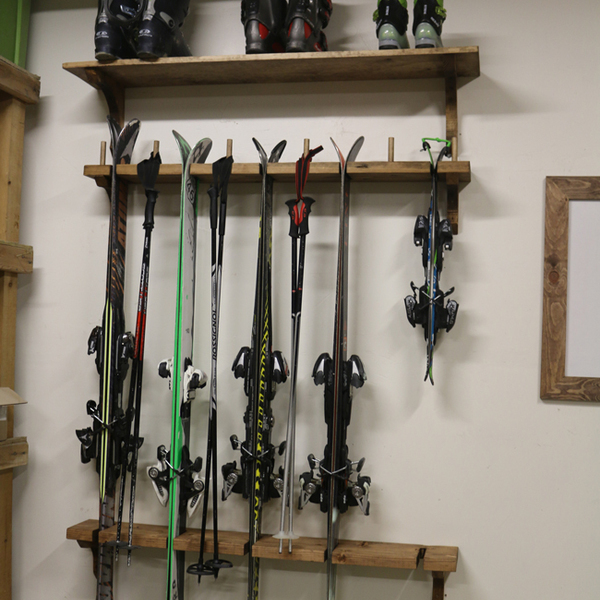 These dowels will hold ski poles. Attach the brackets to each ski rack unit. You can do this from either the bottom side or top side of the board. 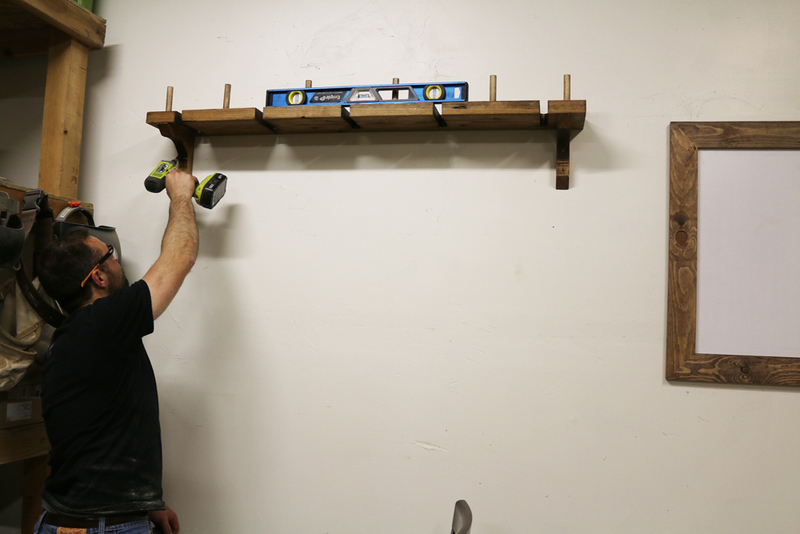 If connecting from the bottom, use a 2 inch screw for the front of the shelf, and a longer screw about 3 1/2 inches toward the back. 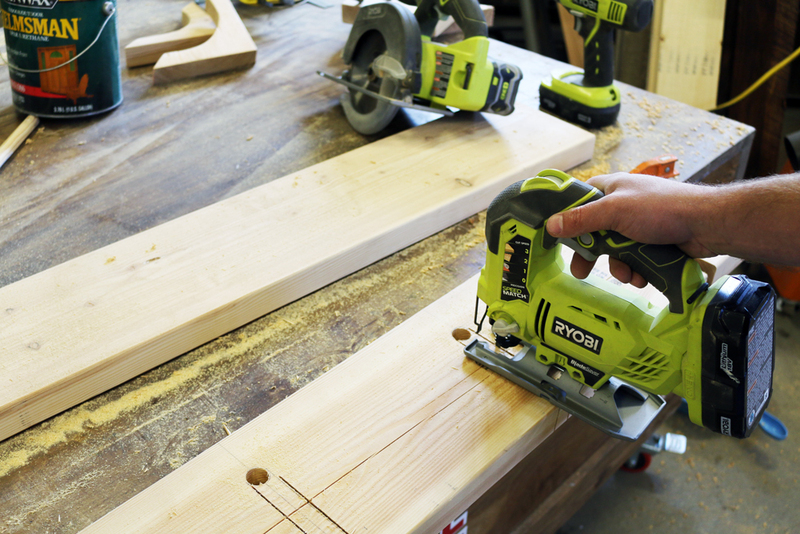 Make sure to pre-drill to minimize the chance of wood splitting. 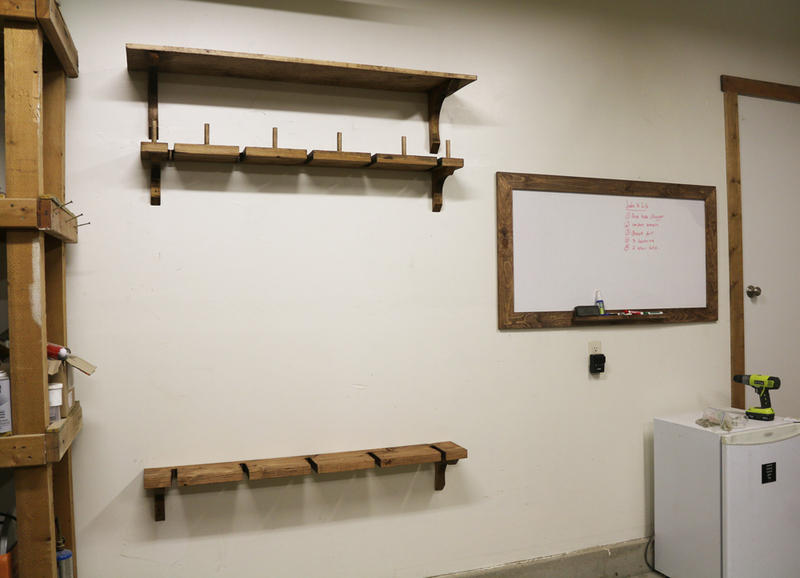 Create an optional upper shelf for boot storage / helmets etc. 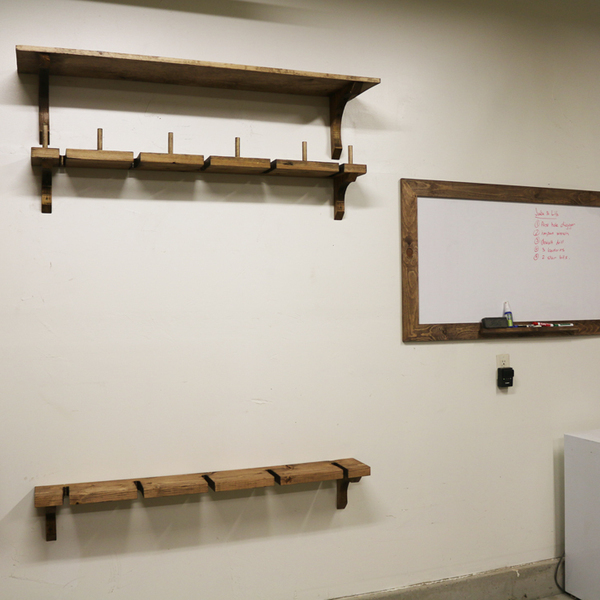 The shelf was made out of a 1x12 board and brackets were made out of a 2x12. 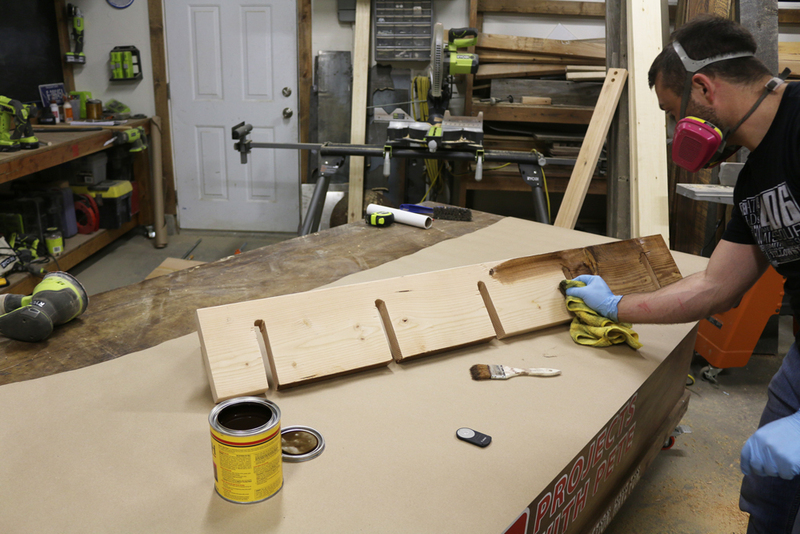 Feel free to use scrap wood or plywood for this upper shelf to save money. You can purchase metal brackets from the store if you'd rather not make your own brackets. 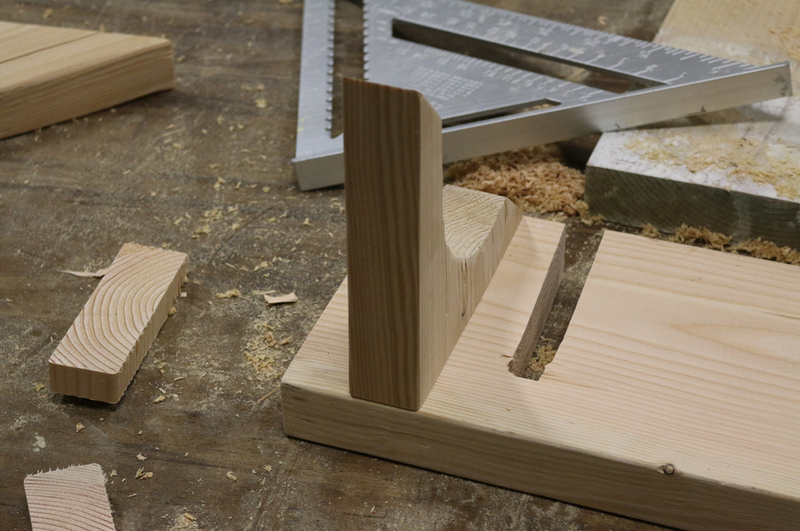 If making wood brackets, use a bucket to help create an arch. 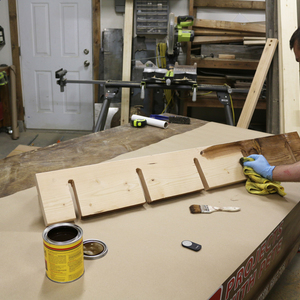 Paint or stain the ski rack as you desire. I used special walnut stain. 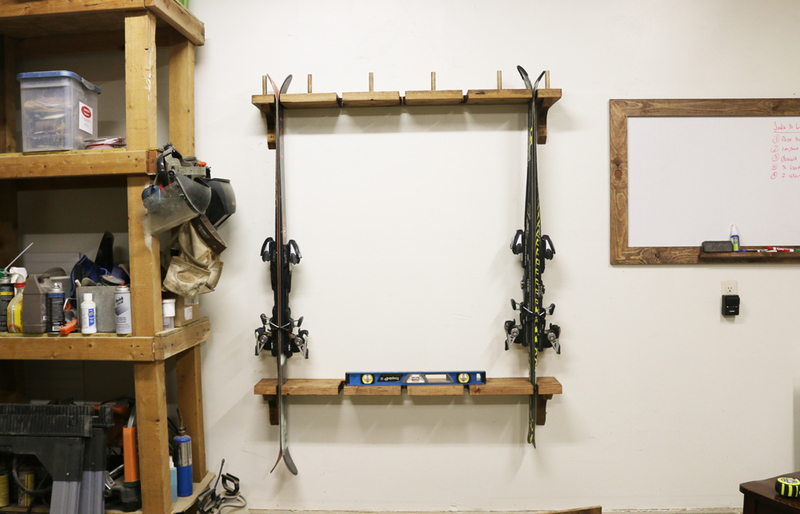 Attach the upper ski rack unit to the wall using 3 1/2 inch wood screws. 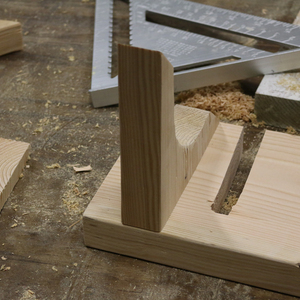 Pre-drill through each bracket prior to inserting a screw. Make sure you the screw goes into a stud in the wall to create a secure connection, and use a level so it goes up straight. I attached the ski rack about 6 1/2 feet up from the ground. This will differ depending on the lengths of skis you own. Attach the lower bracket directly beneath the top so the skis will hang straight. I placed them 49 inches apart. 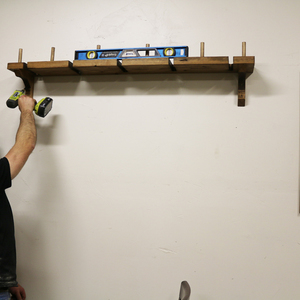 Install the top shelf using 2 screws in each bracket. Enjoy your new ski rack and an organized garage!